Officially the Golden Saddlebred color was infused in the American Saddlebred Horse Association through a horse by the name of Pat Cleburne, who was foaled in 1864. According to the Palomino Horse Breeders of America, the first golden Saddlebred registered was Pot O' Gold, later known as Richardson's Pot O' Gold. This horse was foaled in 1939 and was bred by S.A. Clift of Waxahachie, TX, and registered with the ASHA as Clift's Pride. What does one look for in a Golden American Saddlebred? First and foremost, is conformation. A beautifully shaped, well-proportioned head is a must. The ears are small, alert, and placed at the top of the head. The neck is long, and well-arched, with a smooth clean throat latch. The eye is bold, bright, and intelligent. Well-sloped shoulders and sharp withers well above the height of the hips is characteristic. The croup is long and level with the tail coming out high, and the hind quarters are well muscled to the hocks. The back is short and strong. The long legs are straight with long sloping pasterns that are so necessary for an easy, well cushioned ride. The shallow, full-sprung rib cage make the barrel of the Saddlebred more rounded than in other breeds. Height is generally from 15 to 17 hands and weight from 1000 to 1200 pounds. The complete picture of Golden Saddlebred should be one of refinement, smoothness and strength. Coloring can vary from cream to copper and all shades in between. However, the ideal color is that of the untarnished gold coin. Eyes must be brown or dark. White markings on the face and legs are allowed, but no spots. Mane and tail should be white and purity is desirable. The American Saddlebred is an adaptable horse, and easily trainable. For many years they have carried the image of being high-strung, fire-breathing show horses, but just as every person is an individual, so is every horse. Some temperaments are suitable for the show ring and some are meant strictly for the trail. Each horse, and rider, must find the area most suitable for them. The ways that Golden Saddlebreds can be used are many, there are show horses, pleasure horses and parade horses (in the show ring or down the street). They can be used for eventing and choring, all depending on the individual horse’s disposition and conformation. 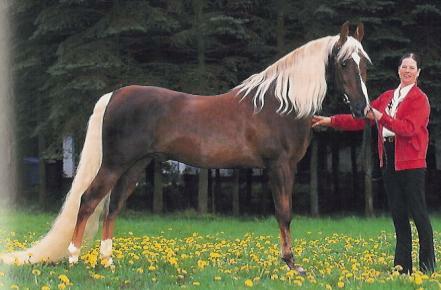 In the show ring, Golden Saddlebreds are eligible in all the classes in the Saddle Horse Division of the American Horse Shows Association and the Golden American Saddlebred Division of PHBA; five-gaited, three-gaited, fine harness, English and Western pleasure, parade, western show horse, driving, trail and so on. One can see the possibilities of teaming a horse with a division are almost endless. The Golden American Saddlebred is registered with the American Saddlebred Horse Association.